About 85% of people with tennis elbow or golfer’s elbow experience pain relief within 12 months of starting their preliminary treatments. A tennis elbow or golfer’s elbow injury will usually heal without surgery. However, if you continue to suffer from persistent pain, weakness or recurring inflammation after trying the above conservative treatments, you may require a surgical option. Although rare overall, this is more common in tennis elbow than golfer’s elbow. The type of surgery you require will depend on the size, shape and location of your injury. This will be completed through day surgery however, it will require extensive rehabilitation utilizing the preliminary treatments noted above. Physical therapy and strengthening normally begin about 6 weeks after surgery. Your surgeon should provide a treatment plan to help you regain normal use as soon as possible. 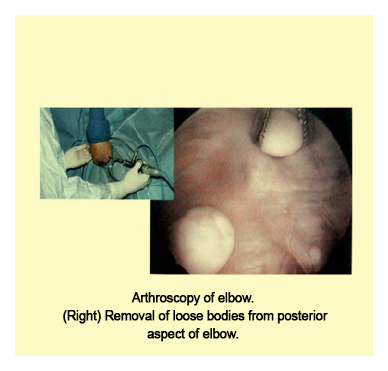 Elbow Arthroscopy involves making a small incision on the outside of your elbow and inserting a pencil-thin, fiber optic camera with a small lens and lighting system. The surgeon will take a look inside your joint to investigate all the soft tissues and bones. These images will then be transmitted to a TV monitor, which allow the doctor to make a diagnosis and/or perform the repair under video control. Your surgeon may repair tears or remove damaged tissue. He/she may have to cut the tendon at its attachment to the epicondyle bone and remove a small portion of the bone to increase blood flow to the area. Afterwards, sutures (stitches and/or anchors that hold the tissue together after they have been severed) can be used to attach the tendon to the bone. At the end of surgery, your incisions are closed, a dressing is applied, and you are placed in a splint. There are always some risks associated with any surgery, which include but are not limited to possible infection, allergic reaction to medications, and damage to surrounding nerves or blood vessels. However, modern techniques have significantly minimized the occurrence of these problems. Tenderness, pain, stiffness and weakness are very common after surgery, but with proper rehabilitation these should diminish. Although surgery is often successful at repairing any damage and/or relieving pain, it does not necessarily return strength to your elbow or forearm. That is why a strong commitment to rehabilitation is essential. Healing and recovery time is generally dependent on the extent of your injury, your age, pre-injury level of function, and your commitment to rehabilitation. It is important to treat tendon injuries as soon as possible, as any activity or strain you put on your tendon can re-injure it further. The trick with any tendon injury is getting it toheal with minimal scar tissue formation. Even with optimum healing, there is always less elasticity in a previously injured tendon. This will cause the tendon to hurt, during exercise and everyday activities. However, if you heal your injury efficiently and quickly, your chance of re-injury later on is much lower than average. Allowing your elbow to rest is always recommended following injury. Avoid all activities that may have caused the injury or irritation and begin cold compression treatments as soon as possible. Blood Flow Stimulation Therapy™ (BFST®) promotes blood flow to heal your tendon faster and more completely than any other methods available. Although steroid injections may provide temporary relief from the pain of tendinitis or tendinosis, they should generally be avoided as they weaken the tendon. If you do opt for an injection, doctors usually recommend that you do not participate in strenuous activities for several weeks to reduce the risk of a rupture.